Family magazine ‘Tots About’ is turning two! 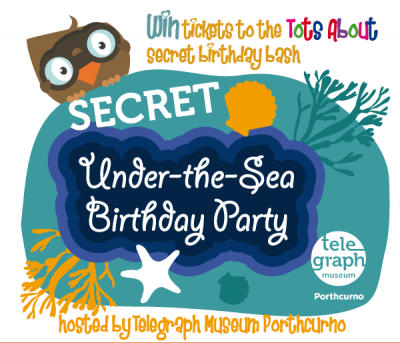 Help us to celebrate by joining us at a fantastic fancy dress ‘Under-the-Sea’ children’s party hosted at the Telegraph Museum Porthcurno, where young explorers will be surprised and inspired by hands-on exhibitions, creative make & take activities, trails, secret tunnels and much, much more. Exclusive party tickets can only be won by entering via the Tots About or Telegraph Museum Facebook pages, so join us both online now for your chance to win, and you and your child could be joining in the fun on Saturday 9th May. Good luck! Entries close Friday 24th April. Join Tots About and the Telegraph Museum Porthcurno on Facebook now to enter. Each ticket permits one child (age 3-5 years) and one parent/guardian only. Tickets are non-transferrable and no cash alternative will be offered. Tickets include entry to the party, refreshments, free museum parking and entrance to the museum on the day of the party only. By entering the competition you are agreeing to take part in associated promotional activity, and giving your permission for us to include you and your child in a promotional photo shoot during the party. Competition closes Friday 24th April. Competition winners will be announced on Facebook and will be asked to contact Tots About/Telegraph Museum Porthcurno to make arrangements to deliver party tickets.